We know that it can be a particular difficult time when ordering a memorial plaque for a loved one but our staff are on hand to help and advise you of the best possible wording, layout and the most suitable materials to use. 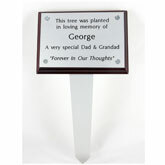 We can incorporate a picture or a symbol to make the plaque more personal. As there are many options available it would be best to conact us personally by phone to discuss your requirements or send us an email. We can provide a visual layout prior to manufacture for you to approve in your own time. We can also supply Bench plaques, tree and plant spikes all with engraved wording as an alternative to the traditional type of memorial plaque.